In a well conceived Website, the conventions followed should be fairly intuitive. Nevertheless, it is prudent to make them explicit, and that is what this document does. The menu for this Website, , always appears (drifts to) the upper left of the window. If the cursor rolls over the menu it opens to show contents and submenus. A click on the desired name opens the page in the present window. All menu items are internal links. The menu, , also serves as the site map. When the menu is open, one can explore the structure of the whole site by rolling the cursor over various portions of it. Links on a page which are internal to this site are shown: internal–link appearance. Internal links almost always open the document in the present window. The exception is links to movies, which although local, do open a small movie window. Links on a page which go to an external site are shown: external–link appearance. The thin shadow indicates that external links always open in a new window. A caption appears when the cursor is placed over the picture. This presents a simple layout of just pictures, but allows the information to be available when wanted. If the symbol appears in the caption, it proceeds the name of a guest photographer. Many browsers allow the site to show an icon, called a favicon, in the address bar. The favicon for this Website is . It represents an old Kootenay Lake dolphin. The foot of each document is marked by a decorative bar displaying the Fraser tartan (Red Fraser of Lovat). As this is the family tartan of the Website’s author, this is clearly a conceit, albeit a minor one. 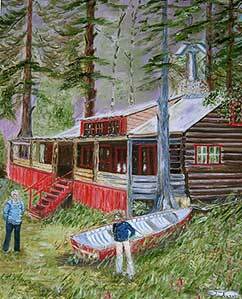 Les Fougères on the site of Ferndale Park in a painting by the late Jessie Fraser, formerly of Fraser’s Landing, Kootenay Lake. The choice of the first is obvious (the site is, after all, about Kootenay Lake); the significance of the other two is personal. Les Fougères I spent childhood summers at my grandparent’s log cottage opposite Troup. Its name, Les Fougères (the ferns), came from my grandfather’s ancestral home on the Island of Jersey. The choice was propitious for not only did the name capture family history, but also the history of the land upon which it sits. Between 1906 and 1914, this and adjacent properties were styled Ferndale Park. The sylvanshine on a Grand Fir along the shore of Kootenay Lake. With its own open-air dance pavilion, the park became the first place of entertainment on the North Shore. Clubs, lodges and picnickers would come the four miles from Nelson by sternwheeler. Sylvanshine This is the name of my home at Crescent Bay. 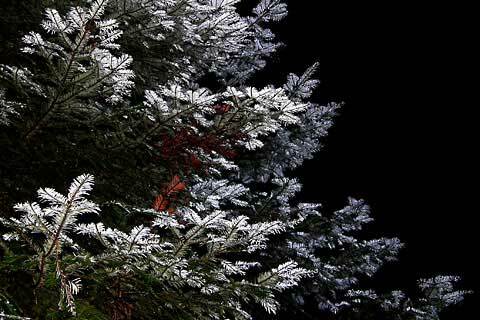 The word describes an optical phenomenon seen around the Lake and elsewhere in which some species of dew-covered trees become highly retroreflective. Elsewhere on this Website, appear examples of the sylvanshine.